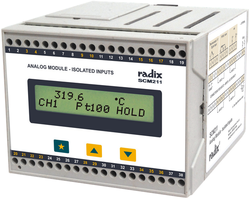 SCM201 is an Analog Input Module that can be used as a cost-effective alternative to PLC (programmable logic controllers). It has 8 channels that receive input from 8 types of thermocouples (B, E, J, K, N, R, S, T), Pt100 RTD sensors, 0-50 mV and 4-20 mA or 0 - 20mA linear inputs. Operators easily calibrate ZERO & SPAN via membrane keys on the front of the unit. SCM201 ships with a SCADA software for remote programming as well. The analog input module can be programmed with passwords, channel scan time between 1 and 99 seconds, power-on delay and more. It’s standard communication baud rate is 4800/9600/19200 bps and SCM201 can optionally be designed for 38400/57600 bps. Its large 2x16 character LCD indicates the channel number, input type & process variable. Our design competency in signal isolation is one of the finest to be found in the Industry. Radix signal isolators are an outstanding combination of frequency response, accuracy and signal handling. Choose from loop-powered isolators which require no external power supply and have very low loop drops, 3-port signal isolators which not only isolate input signals, but also act as signal multipliers and multiply signals to send to multple field instruments. Some of our signal isolators are HART compatible for effortless two-way field communication, that is achieved through superimposition of digital communication on top of the 4-20 mA signal. Looking for Analog Input Module ?